Mmmmmm... mocha! 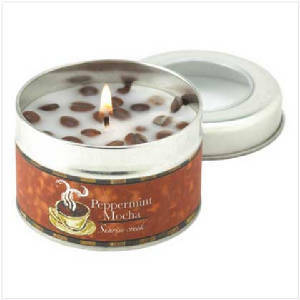 Enjoy a scrumptious blend of Belgian chocolate and richly roasted coffee beans every time you set this marvelous candle aglow. 3.2 oz. 35 hours of burn time. Weight 0.3 lb. Paraffin wax in tin container. 3" diameter x 2" high. Who can resist the rich aroma of dark roast coffee perked up with a hint of mint? 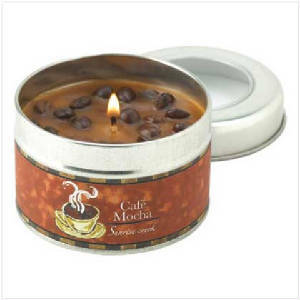 This scrumptiously scented candle lets you savor this bistro classic any time, anywhere, along with a cheerful golden glow. 35 hours of burn time. Weight 0.3 lb. Paraffin wax in tin container. 3" diameter x 2" high.